Once I arrived at Shanghai National Accounting Institute (SNAI), I was welcomed and properly guided through well-organised orientation days and informative sessions. The Institute has a very efficient administrative structure that goes beyond the enrolment procedure. The competent members of staff were also very helpful to us in working out official documents, such as admission documents, residence permit and other procedural issues. Well in advance of my arrival, they had provided me with practical information and guidance, including list of student information, internet password, well-furnished room and a senior student was assigned to me, to take me round the school compound, shopping mall, and subway station. I have learnt and understood much more about Chinese economy, geography, culture, business environment, and the trend facing China and the world. I have learnt about China’s forty years economic reform programme and life of Confucianism. I learnt how to speak Chinese. I learnt that only a simple smile would say a thousand words. I learnt how to make friends and not hurt people. I learnt how things work and how things need to be done. I learnt not only how to be a professional accountant but also how to program my life so that it is free of any calamities. I strongly agree to the fact that going to China was one of the best decisions in my life which taught me many lessons throughout every step. What impresses me so much about Chinese people is their hospitality to foreigners, their culture and the stories told about life of Confucianism, which makes them to be so unique and special. The experience I have gained from China has changed my way of thinking and how to live with people from different backgrounds, such experience will continue to help me in my daily work life. The most significant reasons amongst others why I chose China, is that I believe that Chinese culture may be more suitable to my personality, attitude, and beliefs. I am attracted to Chinese people because I like the way they do things, their social codes and traditions. It is wonderful to go and live abroad because there is a mix of culture which makes one to learn more about the different cultures and thus contributes to one’s modesty in life. Notably immersing in a culture that is extraordinary to you, where you can experience things that wouldn’t be on offer at home in a laudable experience which could possibly makes one assimilate to a foreign culture. Written by Aminata Kera Conteh, 2018 Chinese Government Scholarship student of Shanghai National Accounting Institute. 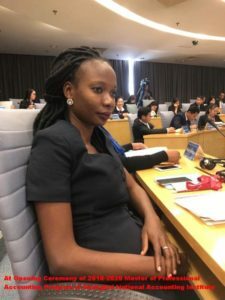 She was an accountant in Sierra Leone and a district registration coordinator of National Civil Registration Authority before studying in China.